Follow @Metagames Twitter and/or use the RSS feed. Fallout: Wasteland Warfare – Development Blog 2: S.P.E.C.I.A.L. I’m always interested in the history of the Knights Templar and I remember seeing a prototype of this game at Essen a few years ago. Players send their knights in missions so they can gain money and relics. A mission if successful if enough knights are sent and these can come from a mix of players, so there’s some possible collaboration. Players can then buy and sell at the markets and events happen. After this, players can send their relics to different locations to put them on display; however, transporting anything takes money and is safer if escorted by knights. Of course, there are various enemies that may attack locations too, so players must allocate their knights and resources carefully. 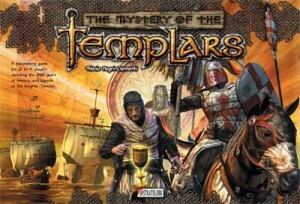 Towards the end of the game, the persecution of the Knights Templar begins and players must try to rescue their relics and try to get them to their havens. When the persecution starts, players can only use money where it is currently located too (whereas, up until then, a player can move their money freely between their bases). 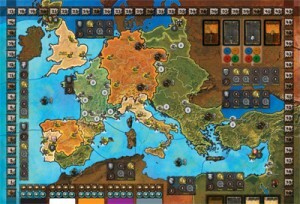 The winner is the player with the most victory points scored during the game, plus points for relics, knights and cash in their havens when the game ends.